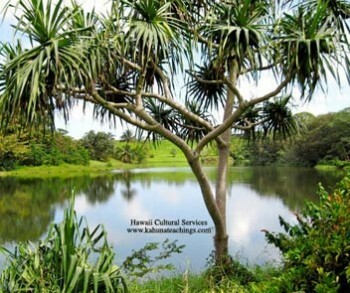 In old Hawai`i a tree was occasionally cut down for utilitarian or functional purposes, for health and safety reasons or if the tree was too old and no longer had any significant value. Customarily, prior to the hewing of a tree, many early Hawaiians prepared ho’okupu (offerings) with accompanying ceremonial prayers to free the tree of any taboo and appease the spirit of the tree’s akua (deity). Respecting this Hawaiian tradition, Mr. Mark Goodrowe invited Kahu Silva to perform the kalai ‘ana i ke Kumu la’au tree cutting rite for male and female hala trees at their home. 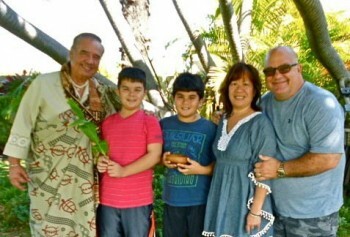 Mark and his ohana (family) also graciously participated in the conduct of the sacred rituals. After the services, Kahu Silva gathered the family members in the spirit of aloha for prayer to give thanks for the blessings that the tree provided for them. Kahu concluded the traditional ceremonies with the proclamation: “Ua Noa” (It is freed). The Goodroweʻs two sons who were very polite and akamai (smart), experienced a practical Hawaiian cultural lesson that day. Like many primitive cultures, the indigenous Hawaiians embraced the concept of creation as a spiritual connection to the source of their existence. They perceived all of nature as a manifestation of the divine energy of a higher deific power they called Ke Akua. These early Hawaiians developed a great respect for the `aina (land) and the flora and fauna that nurtured and sustained them. They considered plants and trees as blessed gifts from the heavenly akua (gods) to help fulfill the needs of mankind in its struggle for survival on earth. In ancient Hawai`i, certain native plants and animals were perceived by the Hawaiians to be the kino lau (embodiment) or terrestrial forms and manifestions of particular supernatural deities. The origin of `ulu (breadfruit) is attributed to the Hawaiian deity Kū when according to legend, during a time of famine, he buried himself in the ground to emerge again as a healthy `ulu tree and saved his `ohana (family) from starvation. Rich in starch, breadfruit is a staple food in many tropical regions from where it spread to areas in the world with similar climates like Africa and the Caribbean. “As a kid I’d love to eat it baked with butter and sugar and I believe that along with taro, that these may be the next superfoods to combat world hunger”, says Kahu Silva. Trunk: Wood for making canoes, homes, drums, surfboards and papa kui`ai (poi boards). Rough inner sheath: Sandpaper for final polishing of bowls, utensils and kukui/candlenut before they were strung into lei. Milky Sap: Used alone or with other plants, it was used to heal cuts, scratches, various skin diseases, mouth sores and throat ailments, moisturizer, chewing gum, glue and caulking for such as canoe building. In the old times, a bird-lime to catch snare nectar-feeding birds. Their brightly-colored red and yellow feathers were prized to fashion capes for the individuals of royal blood. Dried male flowers: Burned as a nontoxic mosquito repellent. Breadfruit leaf patterns are one of the most popular designs used in traditional Hawaiian kapa making (quilting). `Ulu traditionally symbolizes that the keiki `o ka `aina (Hawaii’s precious children – her people) would be nourished for a life time and it honors the perpetuation of the Hawaiian people through the great god Kū.